The Browman 611-202 is a special 87th Anniversary Edition model for 2013. Golden Oak finish on select hardwoods and veneers. The polished brass finished dial offers detailed corner spandrels and center disc, a circular brushed silver chapter ring with applied brass Arabic numerals, and an astrological blue moon phase with a pierced star pattern. Polished brass pendulum with complementing center disk and polished brass weight shells. 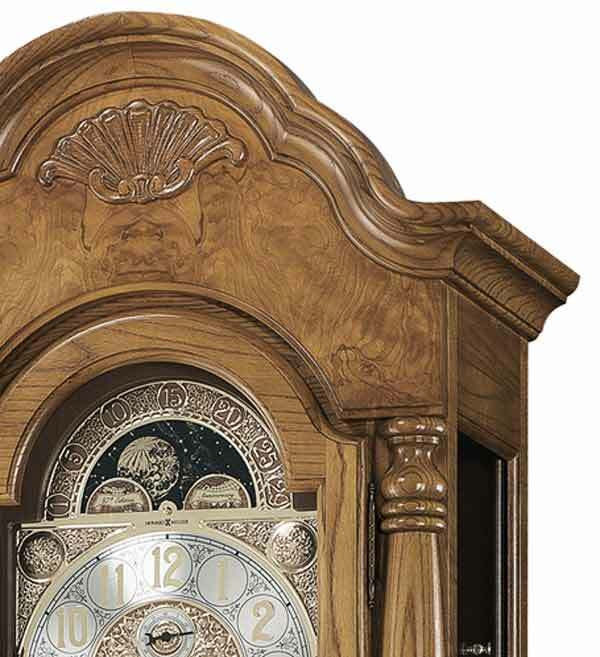 Graceful arched bonnet pediment features book-matched, olive ash burl and a decorative shell overlay. Cable-driven, German made Westminster chime Kieninger movement plays 1/4, 1/2, and 3/4 chimes accordingly with full chime and strike on the hour. Automatic nighttime chime shut-off lever will turn off the chime between 10:00 PM through 7:00 AM and an all chime silence function. Clocks for sale at The Clock Depot including the 611-202 at discount prices.